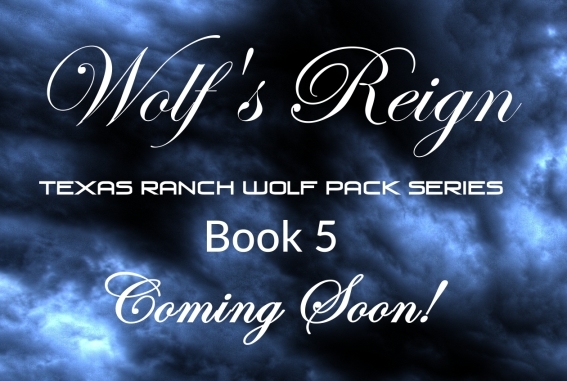 UPDATE: Wolf's Reign will be book 6 in the series. Learn about the new Book 5, Wolf's Trust! I am so excited that books 1-4 are doing well on Amazon. They keep climbing the ranks, and I hope to make writing my full-time career soon! After publishing Wolf's Huntsman (Book 4), I took some time to think through the next book. I have a good idea of what will happen, so it's time to get started on the writing. The first draft of Chapters 1-2 is complete. They both have been through a quick edit, but still need a little editing and revision, but I am including them in this post so you can have an idea of the next book in the story. The oldest living werewolf has a choice to make: Support the new Were King or walk away . . . like he has so many times before. The question is not whether this new contender for the crown is wolf enough to take it. The question is whether he can keep it if he does. Thorkell strode silently through the heavily wooded acreage of the Texas Ranch Pack territory. His soft step quiet, nose in the air, he followed a scent few would be able to trace. The prey he hunted wore at least one of the Ancient’s medallions, making him impossible for most to sense or follow. Thorkell’s soundless hunting steps grew closer and closer to his quarry. Slipping around and through briars and brush, he leaned his shoulder against a live oak tree’s rough bark and watched his prey enjoying the sun. Water warbled softly in the creek running past the flat limestone ledge the black wolf lay on. Soft summer winds breathed through the tree branches, gently rustling leaves and casting shifting shadows, marking the resting wolf, causing his fur to look almost blue when splotches of sun light slipped through. A dragonfly buzzed the wolf’s ear, and it twitched. Birds twittered in the trees, blue jays and red birds chasing each other beneath the deep shadows beneath the trees lining the creek. Yawning, the wolf set his great head on crossed front paws and closed his eyes. Thorkell grinned, counted to fifty, then shimmered silently into a wolf. Paws silent, he crept closer. The only warning the other wolf had was the slight scrape of Thorkell’s wolf’s claws on the rock when he leaped at him. Scrambling to a stand, the black wolf had time for a deep-chested growl before Thorkell’s wolf slammed into him, entangling him in a rolling ball of paws and fur, snarling. Thorkell snapped at the black wolf’s neck. The two wolves rolled across the flat rock, clawing and growling, and splashed into the creek, then rolled apart. Facing each other growls low in their throats, they stood in the shallow water. When Thorkell’s wolf stopped growling and shook in laughter, the black wolf stopped growling and tilted his head, staring at him. He shimmered into human form standing in the ankle-deep water. Thorkell’s wolf yipped, laughing when the Alpha command washed over him. He yipped again and sat on his haunches in the water. Tongue hanging out, he studied the Alpha’s surprised expression. “Shift!” the Alpha commanded again. “That’s me, boy. You won’t find much, but I’m there. When you’re ready to talk, no, when you’re ready to listen, come see me.” Annoyance in every move, the old man stood and walked briskly toward the ranch compound. Nate raised an eyebrow, studying the man’s posture as he walked away. “Doesn’t move like an old man,” he mused aloud. He is Snarl, the oldest living were. You should listen to him. Koreth’s thought surprised Nate. Just how old is he? He asked his wolf. Older than some of the redwoods in California. His left eyebrow climbing almost to his hairline, Nate tilted his head and watched the old man everyone called Snarl stride out of sight. For a moment, Snarl glared at Eli, then shook his head. “You’re just as bad.” He turned on his heel and stalked through the house, slamming the kitchen door as he left. Eli followed Nate up the stairs, his lips twitching to grin at Nate’s mutters. Since learning he was were and taking Jackson’s medallions after their battle, Nate had been ‘top dog,’ so to speak. Eli snickered at the thought, then sobered when Jabril, his wolf, informed him that the thought was insulting. Still, it amused him that having someone, anyone, especially someone as old as Snarl, could defy Nate. It was a new experience for the Alpha. Nate slid into the chair behind his desk and pulled Janelle’s laptop from the corner, opening it and powering it on. He drummed his left thumb on the desktop while waiting for the system to boot, then opened the browser. In the address bar, he typed ‘Thorkell Leifsson’ and pressed Enter. Eli jerked his gaze from the screen to Nate’s eyes. “Die?” Eli swallowed at Nate’s fierce gaze. When Nate walked out of the office Eli was right behind him. Nothing and no one was going to threaten his brother’s family. Or his own, either. Nate stepped off the back porch and took a deep sniff. Identifying Snarl’s scent, the smell of musk and old paper, he followed the trail out of the compound and into the woods. Snarl, the wolf, was sunning in the same spot Nate had been enjoying when Snarl attacked him. Old as he was, Snarl’s coat was shiny, solid black, and full. The old wolf watched the two men walk up to him and sit on boulders. Knowing it was useless to try, Nate didn’t tell Snarl to shift. Instead, he sat patiently on his boulder, waiting for the old man to decide to change. Snarl’s eyes focused on Nate. For a moment, Nate felt Snarl try to place compulsion on him. Narrowing his eyes, Nate continued to stare at Snarl’s eyes as they glowed red, then faded back to brown. The wolf bowed to Nate, then shifted into Thorkell. When Nate didn’t answer, the old wolf laughed again and shrugged. “Might have, when I was a young pup, too stupid to know better.” The old man chuckled and sat on a boulder facing Nate. His eyes lost focus for a moment. “No, I had my turn as Alpha. It cost me everything. Don’t want it, again.” He cleared his throat and turned his attention back to Nate. I am enjoying writing this fifth book in the series. I'll have the cover reveal soon! Have comments about the series? Post them in the comment section below.